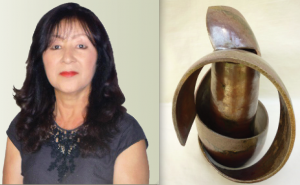 LONG BEACH – Ceramic artist Reiko Niwa Berg will exhibit her ceramic artwork at the Assistance League of Long Beach Philanthropic Center, located at 6220 E. Spring St. (between Woodruff and Palo Verde), Long Beach, from Oct. 7 to Nov. 27. Reiko Niwa Berg and her “Entangled Vase #1,” which is on display at Cal Poly Pomona. A wine-and-cheese reception to meet the artist will be held on Sunday, Oct. 13, from 3 to 5 p.m. Both the exhibition and reception are free and the public is invited. Berg’s ceramic pieces have evolved from traditional Japanese tea ceremony utensils to organic, free-form structures that are reflective of a variety of techniques. “Often, my vision for my pieces is to explore movement in clay via structure, color and texture while maintaining mechanical strength,” she says. A piece from her “Entangled” series will be on display. “Entangled #1” is in the collection at the Kellogg University Art Gallery at Cal Poly Pomona. She also has pieces at the American Museum of Ceramic Art and numerous private collections, and is a recipient of the James H. Jones Memorial Purchase Award at the Ink and Clay 38 Exhibit and the Loyola Marymount University Honors Award. Berg will donate a portion of the exhibition sales to the Assistance League of Long Beach (www.ALLB.org) philanthropic programs, which include Operation School Bell, which gives free school uniforms to 9,200 children in need in Long Beach; an orthodontic center that provides quality orthodontic care for 800 low-income families; scholarships for deserving students at CSU Long Beach and Long Beach City College; and the Howard Collection tours, which provide enrichment for seventh-grade students on Asian history and culture. Exhibition hours are Monday to Thursday, 8 a.m. to 5 p.m.; Friday, 8 a.m. to 2:30 p.m.; or by appointment by calling Faye Alperin at (562) 659-0051.